This is a great time of year to get out and go on a hike. There are many choices in the Valley of the Sun. One of the first grade teachers at our school loves the Hieroglyphic trail. 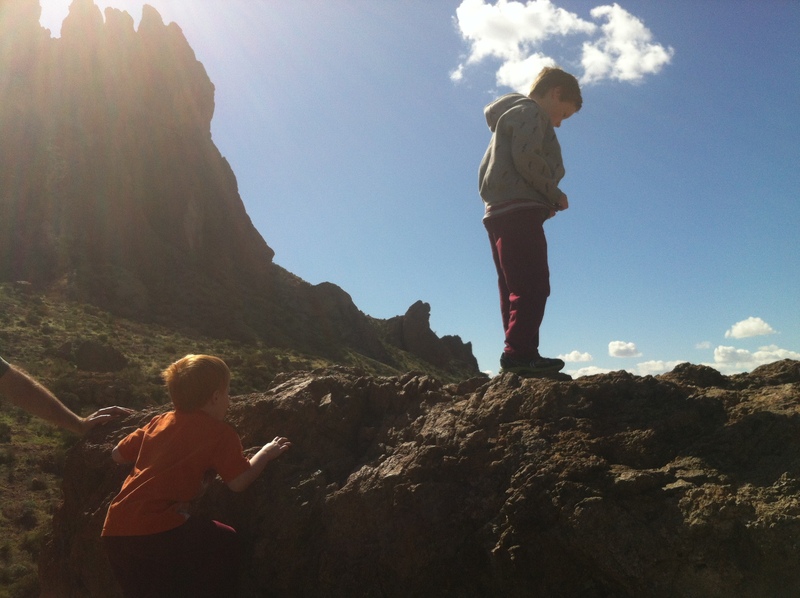 My favorite is the Treasure Loop Trail at the Lost Dutchman State Park. We walk up to the Green Rock and then turn around and walk back the way we came. It is $7.00 per car, to visit the park for the day. You can park in an upper visitor lot for free for 30 minutes if you only want a quick peak. But only if you promise to come back later. Where do you like to hike? Our favorite is the Treasure Loop Trail. 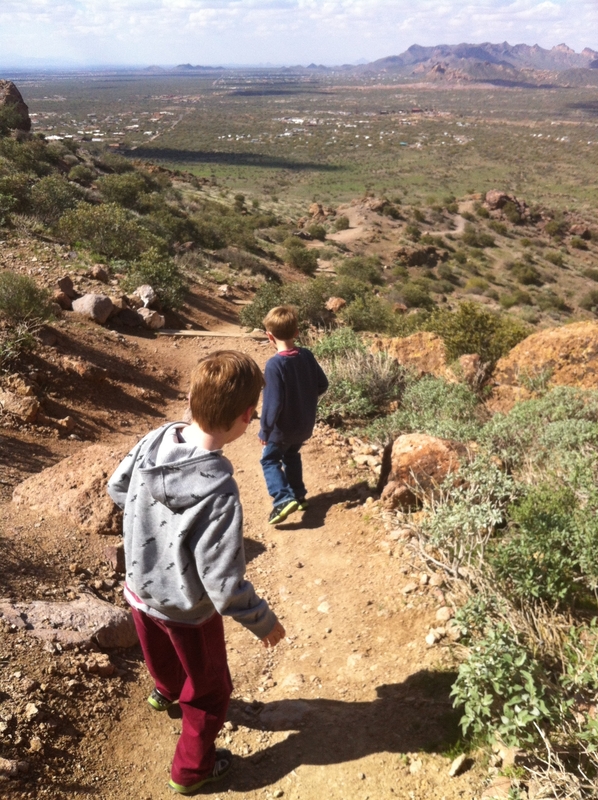 Easy trail, gradually climb, less than 2 miles, less than an hour, benches if resting is necessary during the hike, great views of Goldmine Ghost Town, Maricopa County, and downtown Phoenix in the distance. We have an ambitious family goal of camping once a month. April looked shaky, we didn’t know where to go. 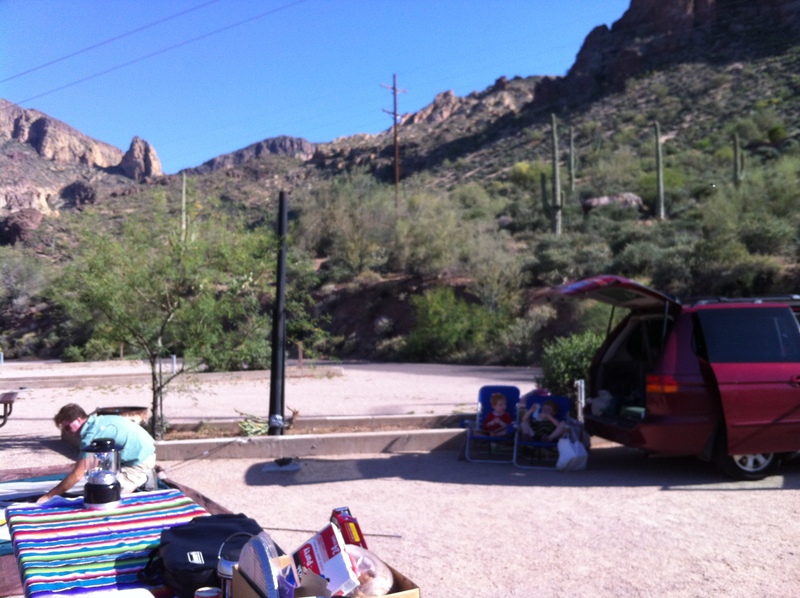 I pulled out my trusty 144 best campgrounds in AZ late Friday night, but could not decide. It is the cusp of the season here. The winter campgrounds are hot, the cooler campgrounds open in May. 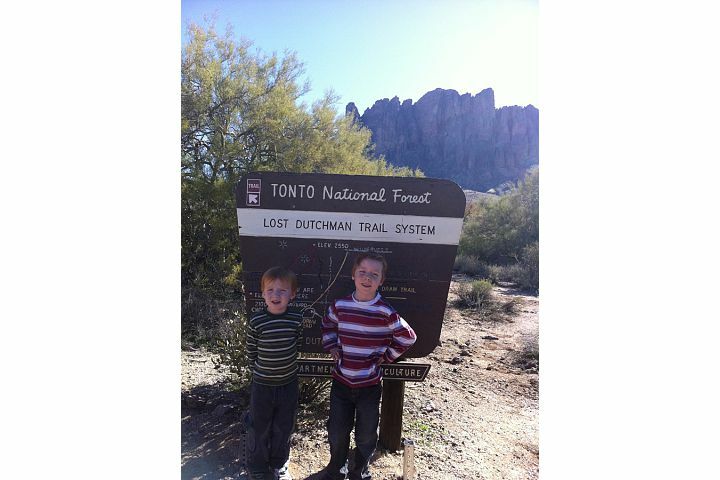 We considered Tonto Natural Bridge, Christopher Creek. I dismissed Tortilla Flat because I wanted to sit in the trees. To be honest, I know very little about camping and even less about local campgrounds. The only way to change is get out and go. 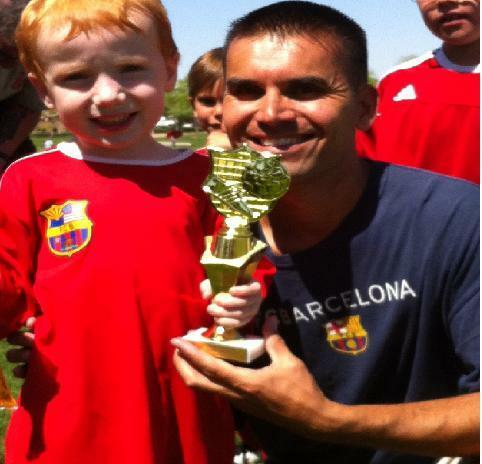 In the morning we attended a final soccer game, then home to an unpacked car and a messy house and no destination in mind. So with no better idea, and the fact that we were running into the afternoon, we picked Tortilla Flat. It was close by. Finding trees and shade is too much drama in this part of the world. We packed hastily, chucked a cooler in the car and hit the grocery store on the way out for hot dogs and smores fixings. We took the Apache Trail, the drive is relentlessly, crushingly, world heritage style beautiful. I took this photo with my phone, I can imagine a real photographer happily spending their career here and never running out of inspiration. It’s that awesome. The Apache Trail is a state scenic by-way. Simply driving on the trail makes you think you are on vacation. It’s recommended as fun for people that live in Phoenix. I disagree. I think it is great for anyone in the world. I honeymooned in the Canadian Rockies and I felt like the Apache Trail was just as gorgeous. What a treat. We arrived around 3PM to a nearly empty campground, blazing heat, no shade and buzzing black flies. The awesomeness of the scenery made up for all of that. We made our own shade with the mini van and waited for the relief of sunset. 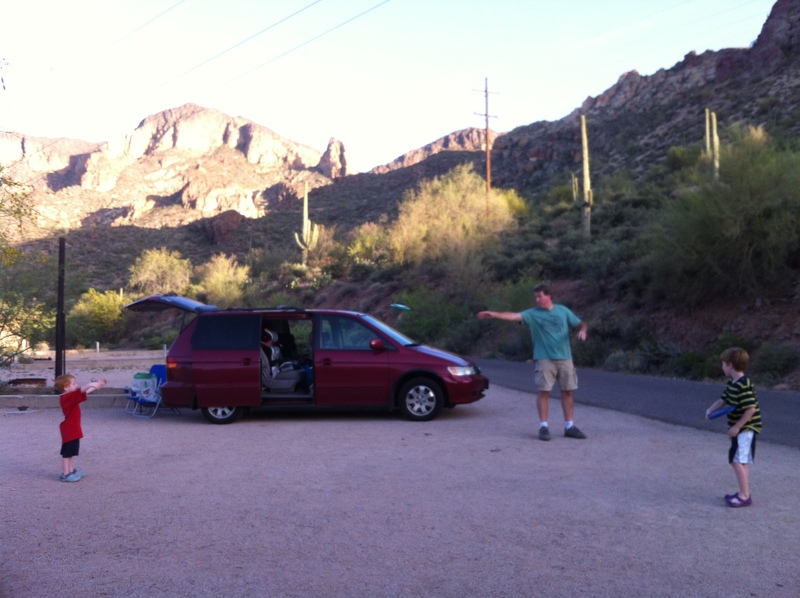 Camping at Tortilla Flat requires a 24 hour Tonto Day Pass ($6.00). These inexpensive passes are available at many local businesses. We bought ours at the Circle K in Queen Creek. We passed a CVS that had a sign advertising Day Passes Sold Here. The closer you are to the Tonto National Forest, the more vendors you will find, pop in any convenience store and ask. If you don’t have a pass you risk a fine. The campsites were arranged in three lanes, in tiers, You drove through a one way loop and looked for the best one. All were flat, treeless and covered with fine gravel. We picked #14. Recreation choices abound at Tortilla Flats. There is a marina, a small row of stores/museums in the tiny town of Tortilla Flat (population 6). As the afternoon waned, the experienced people filled up the campground (and avoided the baking heat). The dusk brought out the wildlife. Mine and the desert dwellers. The Tortilla Flat campground is situated in the Canyon Lake Recreation area. 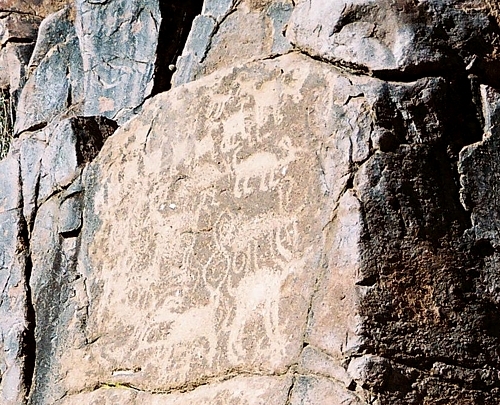 As the afternoon fell, a coyotes howled across the canyon. At dusk he loped downhill, thin and grey as smoke to join his friend. I did not take a picture I was too busy picking up Max and walking backward to let him go by unimpeded. From our vantage we could follow him in and out of view, I was glad for the sparse desert vegetation. 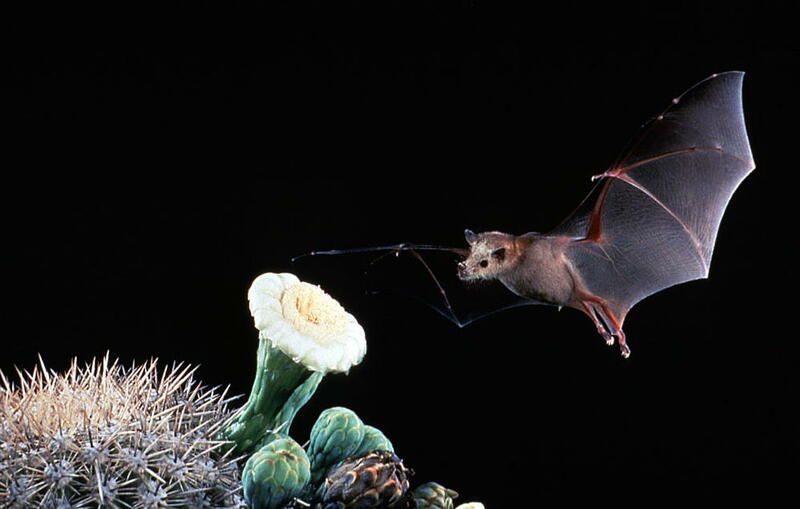 As the sun set over the canyon rim, the bats came out fat and chunky, feasting on bugs. I wished we would hear the coyote again and was rewarded twice more that night with their lonely desert music. Heaven. I will go back over and over again just to hear coyotes calling within a canyon. 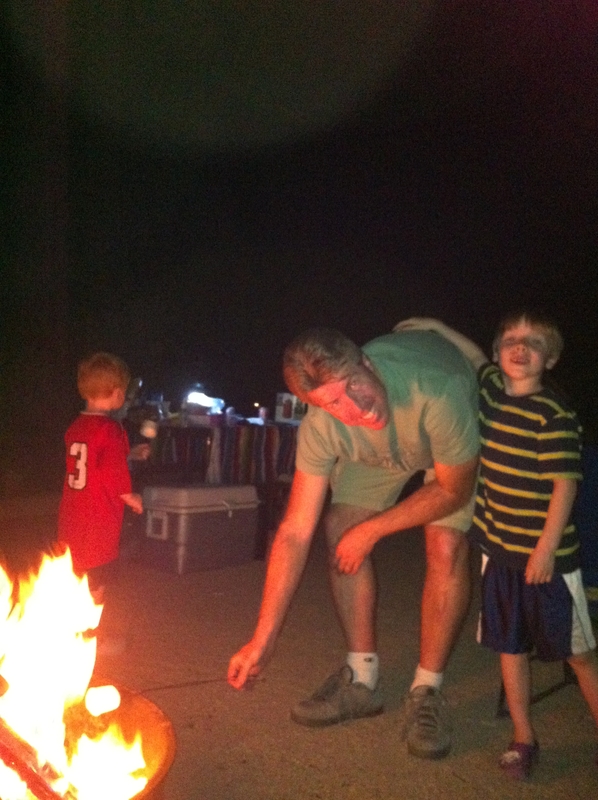 After we made smores, the boys washed up in the bathroom that had flush toilets AND sinks with running water. A real bathroom. I was so excited I felt like someone had given me a one hundred dollar bill. These bathrooms were situated throughout the campsite, sealing the deal of Best Campground Ever. The next morning found us breaking down camp fairly quickly, without shade the campsite was not a welcome place to spend the day. The camp closes for the season on May 1. 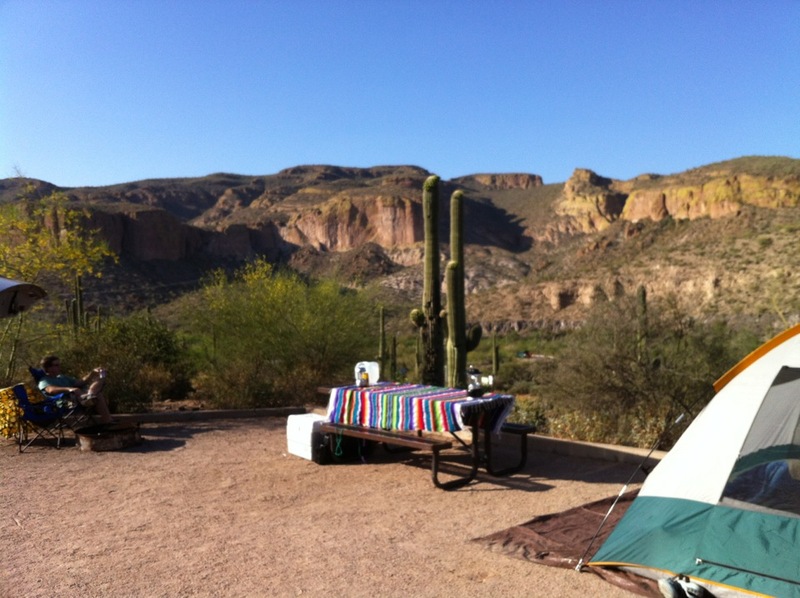 We will be be back in November, Tortilla Flat made the list for local winter camping. Of the six places we’ve camped this past year, we saw the most wildlife here: coyote, rattlesnake, bats, quail, turkey vulture and hawk. 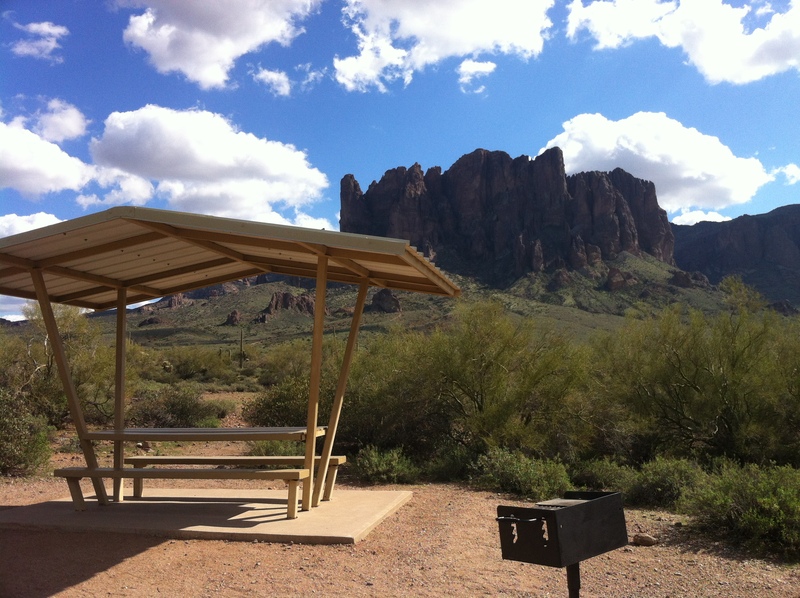 The 320 acre Lost Dutchman State Park features my favorite mountains (so far) in the Valley of the Sun. I love the name “Superstition Mountains”. Now that my youngest is 4 we decided to tackle a family hike. I planned for the best case (hike) and worst case (drive). We decided to hike a portion of the Treasure Loop Trail and then drive on the Apache Trail to the Tortilla Flats restaurant. What I like about this plan is that the drive features the Apache Trail Scenic Byway. We paid an entrance fee ($6.00). The park has amenities. You can camp here, reserve ramadas for day use. 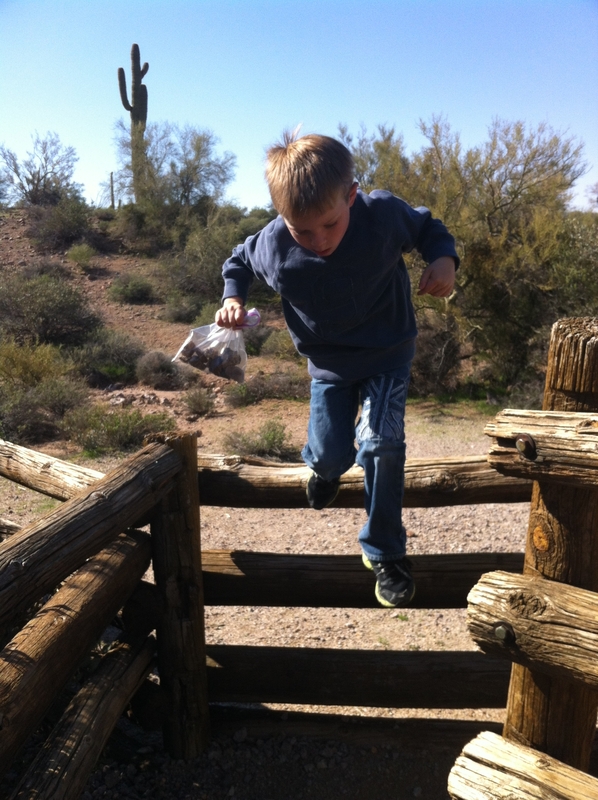 If I had to do it over again, I would have prepped my Junior Rangers a little and downloaded activities for the boys. Next time. This hike was a roller coaster of emotion for them. The were alternately defiant, then starving, then passive, then very weak and must be carried. They flopped in the dust complaining. Then they recovered and ran full steam towards the rocks. My little one tried to cut across the park towards a particular rock configuration that looked like a throne to him. He was devastated when I told him to “stay on the highlighted route”. We corralled them and soldiered ever closer to giant boulders in great cliff walls and rock towers. Very cool. 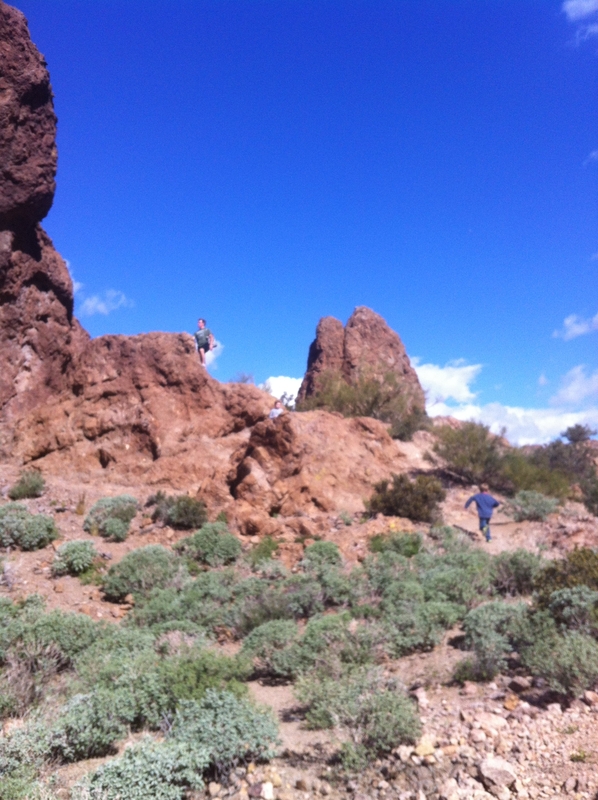 We wended a steep and narrow trail and finally halted in a cluster of giant rocks. We could see trail layers extended upward and closer to the rocks but we had already been walking for an hour and little boys were whipped. Do you find my vague and non technical description of the hike lacking in useful descriptions? Hiking is new to me. Future posts will be littered with helpful asides like “jojoba” and “basalt” but all I can offer you now is starved desiccated plant things and big rocks. I need to get my Junior Ranger badge. The nice thing about stopping at that point was the way down was easy. It was all downhill. I daydreamed as I carried my younger one down the mountain about the legendary lost gold mine and how epic would that be if our inept little crew solved a hundreds year old mystery and found it. Perhaps next time. Once at the bottom of the trail we used the restroom (clean) and the water fountain (cold!). The little one was nodding off as we pulled out of the lot. 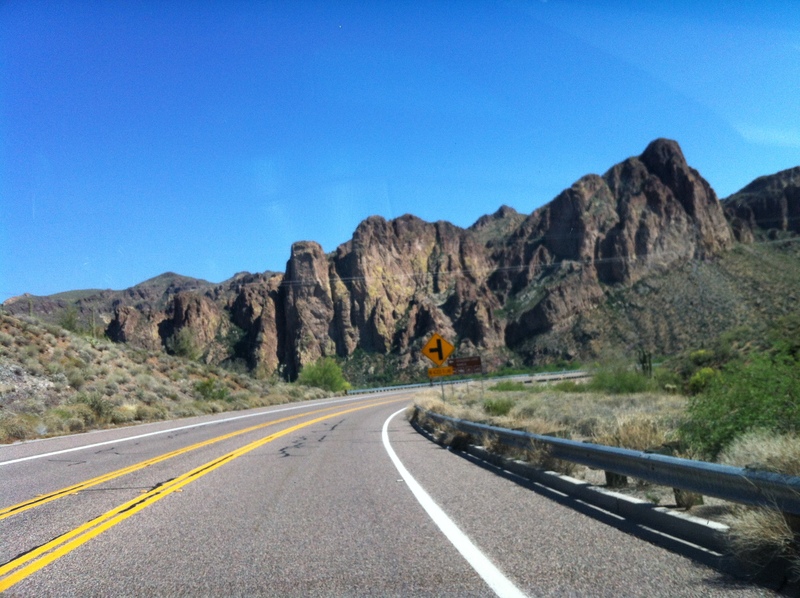 We took a right onto the Apache Trail and enjoyed amazing scenery. The road was crowded with cars and motorcyclists but that did not detract from the beauty of the drive. Tortilla Flats is about ten miles beyond the park. It was crowded so we didn’t stay. We’ll be back when we have out of town guests, but in the meantime, two sleepy boys meant it was time to head home.